Located in the heart of Watarrka National Park, Kings Canyon lies in an ancient Australian landscape that is sacred ground for the Ulpanyali and Lilla people. 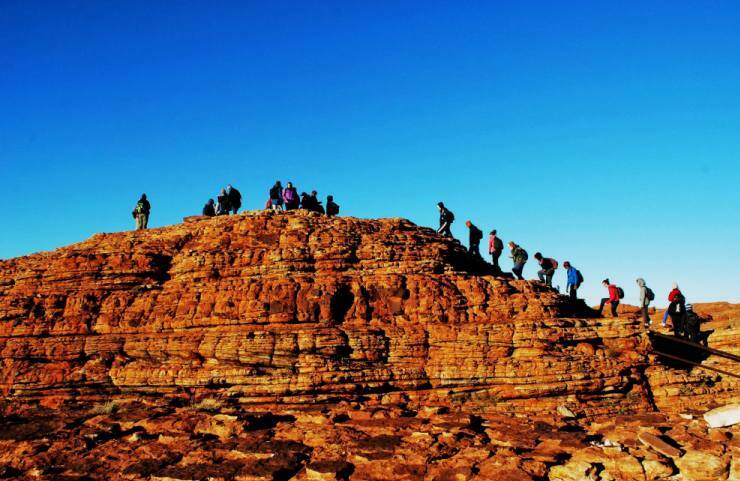 In Kings Canyon make the rocky climb with your guide to the rim of the canyon to be rewarded with marvellous views over Watarrka National Park. The climb may take up to three hours and is for those with a good level of fitness. Or explore the boulder-strewn creek bed, an easier shady walk following the trail between the two sheer walls of the canyon. The six kilometre Rim Walk is a once in a lifetime experience. Climb up a 100 metre cliff face and walk around the rim of the canyon. Marvel at impressive views of sandstone walls, grottos, chasms and cliffs. Deep down between sandstone cliffs, is the Garden of Eden. Here is a natural spring waterhole surrounded by local and exotic plants and trees such as gums, bonsai looking trees and enormous prehistoric ferns, creating a truly unique landscape. The Creek Bed Walk is ideal if you’re interested in something more relaxing. After taking in the sights, set off on a two kilometre stroll along the creek bed, with views of the impressive canyon rim. You will need to bring your own water bottles, which altogether are able to hold a minimum capacity of 3 litres per person (these can be filled with water on board the coach). We highly recommended that you have sturdy walking shoes, comfortable protective clothing, a hat and sunscreen as well. During the hotter months of the year where temperatures can reach and exceed 36° C or 97° F, the Watarrka National Park Rangers strongly advise that visitors do not take part in the Kings Canyon Rim Climb. In this drier desert climate heat exhaustion, over these hotter months, is a very high possibility and a danger in such remote regions. To ensure the safety and enjoyment of our clients we offer a guided walk along the Kings Canyon creek-bed as an alternative. Our special discounted rates make booking accommodation with us during your holiday both easy and affordable at selected hotels and resorts. Good level of fitness require for the three hour walk around the canyon’s rim. Or, low to moderate level of fitness required for the canyon floor walk.